Are you looking for a relaxing holiday? 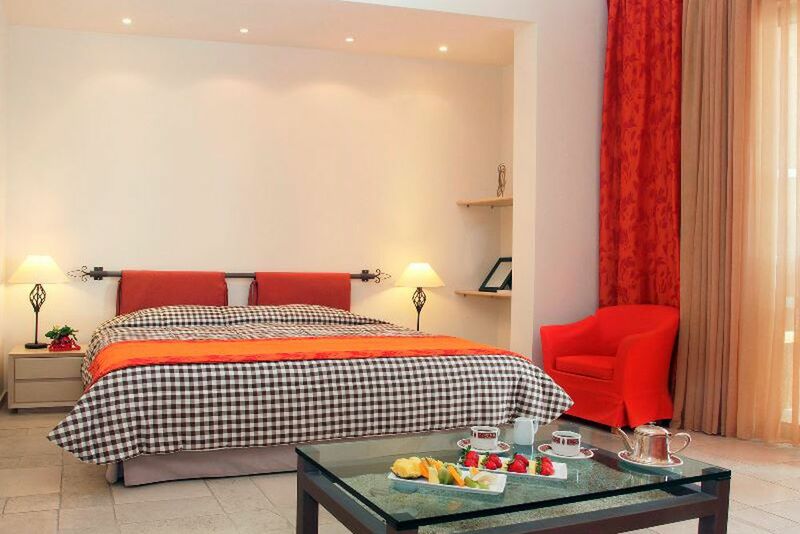 The luxurious Eagles Palace Hotel & Spa caters to your every need. This luxurious environment transforms your holiday into a unique experience. That's what relaxation looks like. With tasteful, elegant interiors, a feel-good atmosphere comes naturally. 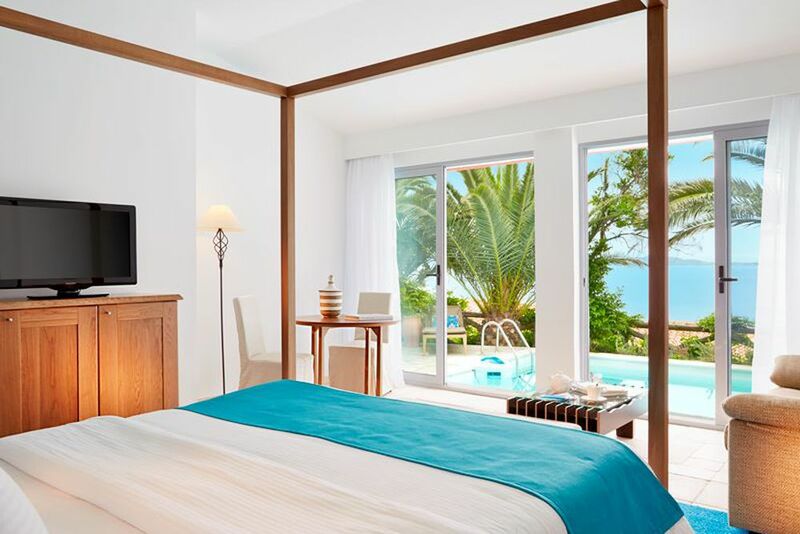 Enjoy a wonderful view from your bed, either on the lush garden or on the crystal clear sea - simply beautiful! It goes without saying that the rooms come with every luxury amenity. If you're looking for deightful culinary experiences, the Eagles Palace Hotel & Spa is the perfect place for you. Look forward to local and international delicacies. 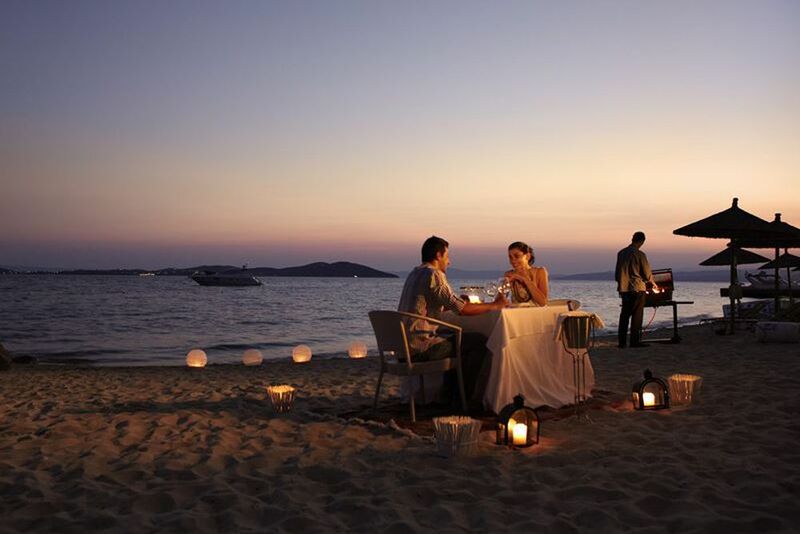 Enjoy the fine delicacies under the open sky. Pure romance! This is exactly how you can end the evening with your partner. You can also relax at the spacious outdoor pool. Enjoy a fruity cocktail in the cozy lounge. 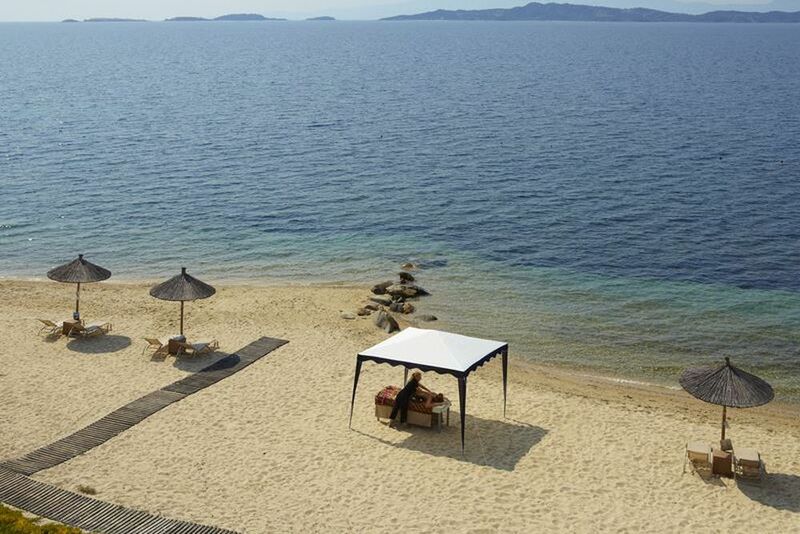 Fancy a soothing massage on the beach? Let yourself be pampered while watching the waves. Melt into your surroundings whilst enjoying impeccable services and breathtaking environments at the unforgettable 5-star luxury hotel and spa, Eagle Palace Hotel! 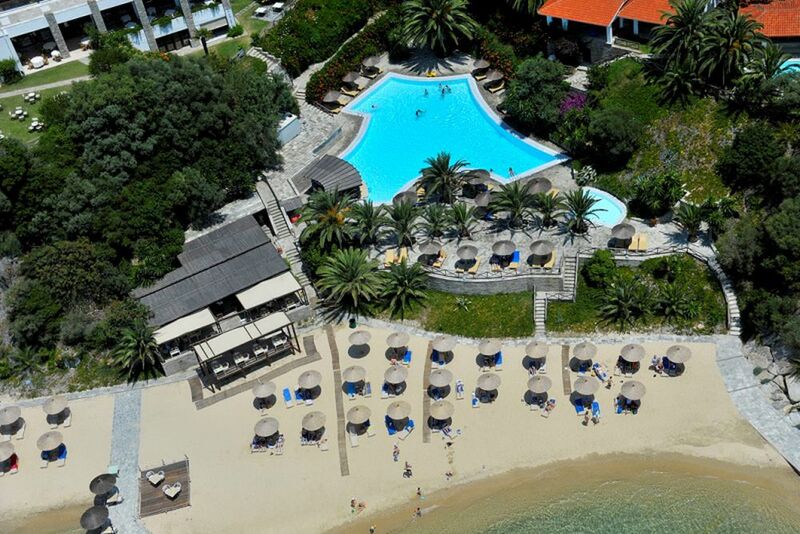 Nestled in the peninsula of the picturesque village of Ouranoupolis, Halkidiki in Northern Greece lives Eagle Palace Hotel & Spa. The location is the third and most charming peninsula, offering breathtaking surroundings, like the mystic Mount Athos and the superb greenery of Northern Greece. When seeing the UNESCO World Heritage site for the first time, you will be stunned by its beauty and powerful presence. The majestic journey to Mount Athos will be an adventure that you and your loved ones will never forget! The 5-star luxury resort is surrounded by crystal clear water, a pristine beach, and verdant, natural surroundings that will take your breath away. 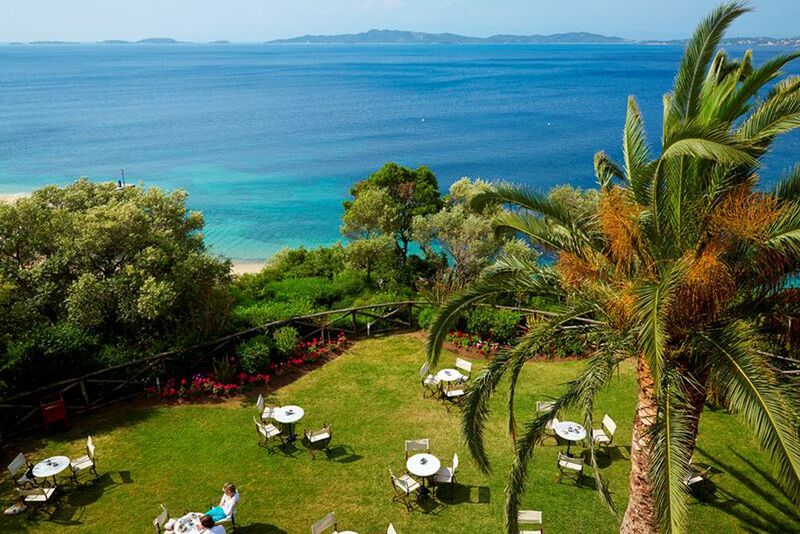 Enjoy unforgettable views of the coastal landscape, the island of Ammouliani and Mount Athos. 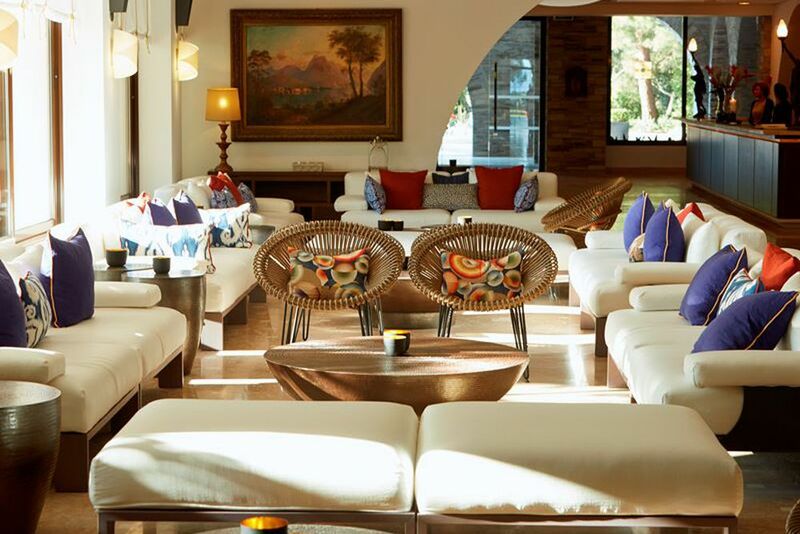 Succumb to the magical aura of this amazing luxury resort. The airport in Thessaloniki is 90 minutes away. We recommend renting a car to explore the interesting and cultural surroundings. 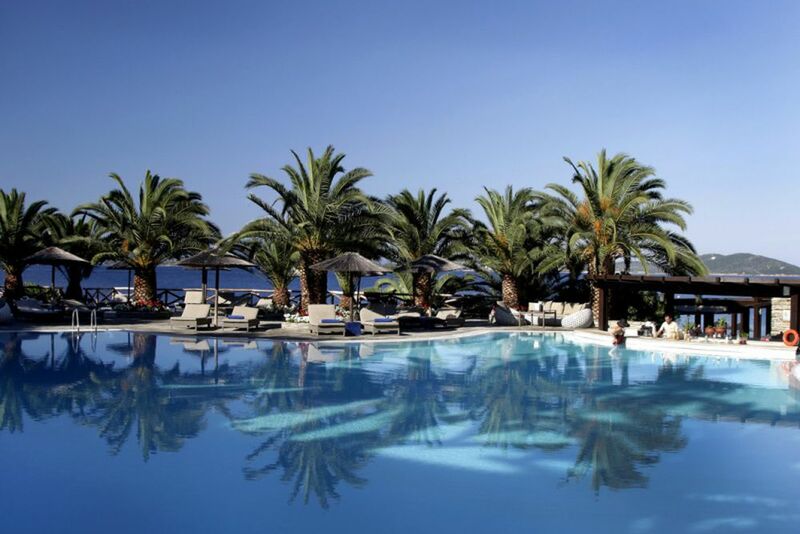 Renew yourself in one of the most majestic beach resorts in Greece! The 5-star hotel promises you an unforgettable vacation full of grandeur and splendor. The unique hotel is breathtaking due to its location, flair, monastic architecture and environmentally friendly practices. The hotel combines the mystique and romantic atmosphere of its surroundings with luxurious facilities and services one requires for a dreamy vacation. Swim in the outdoor salt water floatation pool, or linger in the extensive gardens. They also spoil guests with 5 restaurants that offer a wide variety of international and local delicacies. Kamares Restaurant creates dishes full of authentic Greek and international flavors from local ingredients. Enjoy these delicious meals on the lovely terrace, where incredible views complement your experience. Armyra offers Greek specialties and à la carte dishes that will impress all palates. 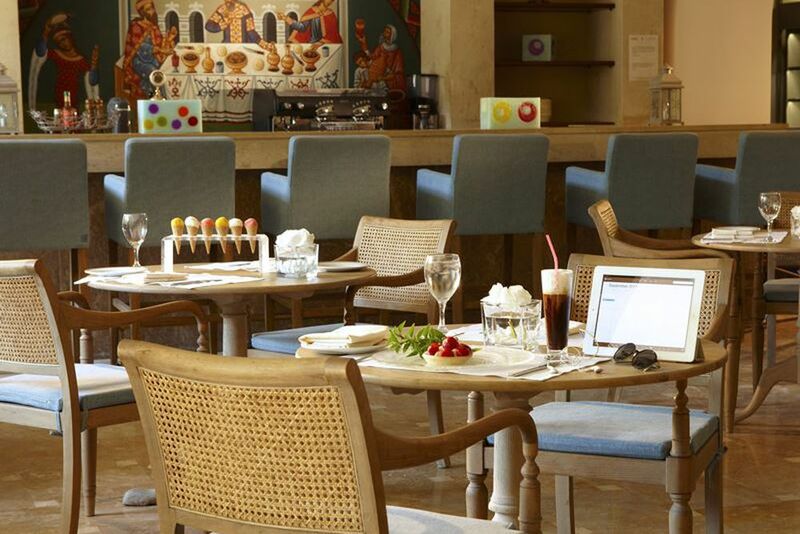 In Melathron, start your day with an extensive breakfast and a themed buffet in the evening. The meals will impress you with its international and regional flavors. Washi Asian serves Asian culinary delights that even the most discerning palates will enjoy. Visit Eagles Café, Eagles Club and Ammos Beach Bar for live music, refreshing cocktails and small snacks complemented by an evening sunset and the sandy beach. There is a 24-hour front desk, a tour desk and a special wedding service available for guests. Eagles Palace also offers a variety of services and facilities for the younger guests. The Kids Club offers a babysitting service, a play meadow and a separate children’s pool! All 164 rooms, luxury suites, private pool suites and bungalows are modernly equipped with high-quality materials. The tasteful and elegant décor boasts bright colors and luxurious marble bathrooms. All rooms have sea or garden views, are equipped with two beds or a double bed, a comfortable seating area, a luxuriously furnished balcony or terrace, air conditioning, flat screen TV, telephone, TV, Wi-Fi, bathrobes and slippers, beach towels and a minibar. Superior Room Garden View (25 sqm)—Offering elegant and luxurious accommodations overlooking the superb Mediterranean gardens of the hotel, with a unique atmosphere that takes you right into the heart of the Greek comforting nature. 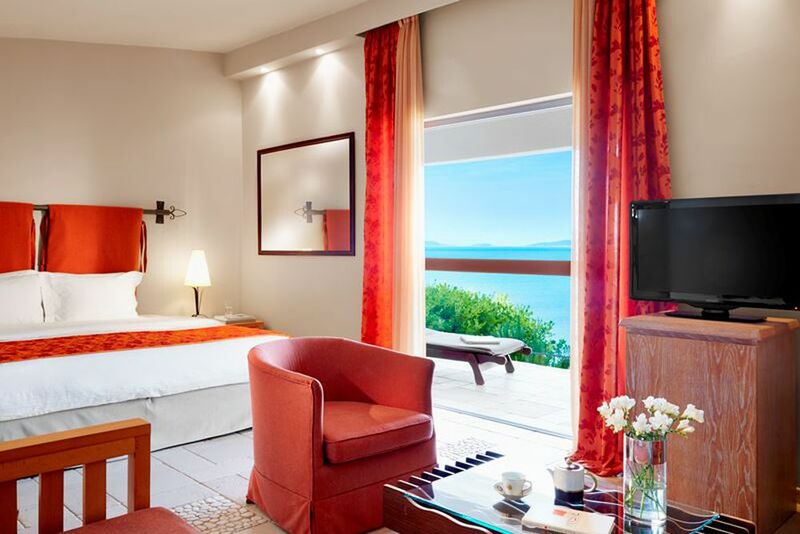 Superior Room Sea View (25 sqm)—Offering an elegant and luxurious accommodation combined with the breathtaking view of the sunset and mesmerizing blue sea, these rooms will promise an unforgettable holiday experience. Family Suite Garden View (40 sqm)—Enjoy the spacious rooms that are divided by a sliding door separating the sleeping and living areas for more privacy. The comfortable terrace overlooks the garden, offering a unique experience for the entire family. Bungalow Sea View & Pool (50 sqm)— Hidden by the palm trees and the lush gardens, these bungalows offer as much intimacy and privacy one might expect from the ideal getaway. Just a breath away from the golden beach, these luxurious getaways offers impeccable views of the surrounding sea. Further suites and bungalows (also with private pools) available upon request. Spoiling you relaxing massages and soothing body treatments that will bring your mind, body and soul back to tranquility, Elmis Spa will take your breath away. Choose between different therapeutic massages, exotic spa therapies, sauna, steam bath and laconium. 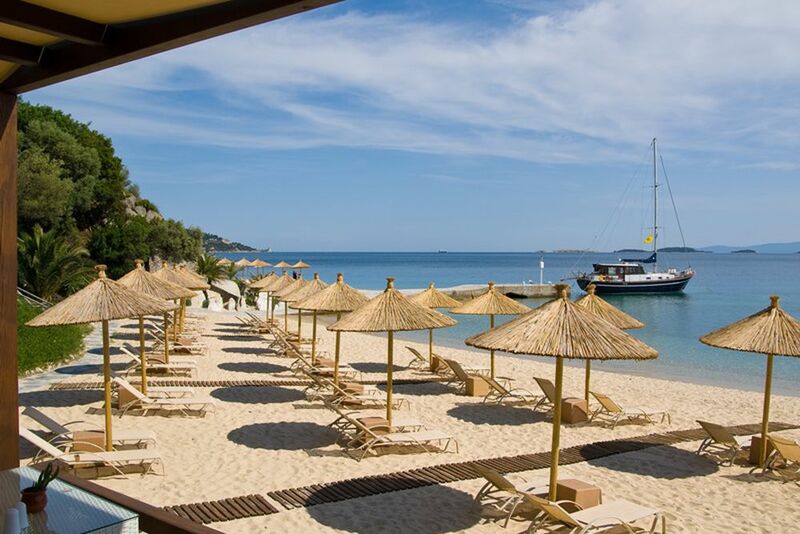 The warm Mediterranean sun kisses your skin at Danai Beach Resort and Villa’s idyllic oasis.